A reborn doll is a manufactured vinyl doll that has been transformed to resemble a human baby with as much realism as possible. The process of creating a reborn doll is referred to as reborning and the doll artists are referred to as reborners. 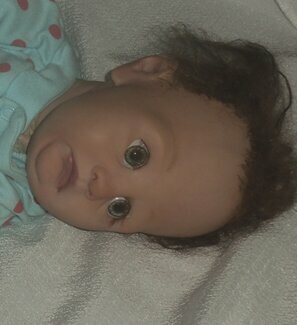 Reborn dolls look so real they have been mistaken for real babies. In July 2008, police in Queensland, Australia smashed a car window to rescue what seemed like an unconscious baby only to find it was a reborn doll. The police stated that the doll was "incredibly lifelike" and that bystanders who thought a baby was dying were frightened by the incident. BABY READY FOR ADOPTION !!!! !